Have you ever taken the time to consider what Jesus did for you on the cross of Calvary? I’m not asking if you are a religious person, or if you do many good deeds; but rather, have you considered what Jesus did for you on the cross. If you have not, will you take the next few minutes, and think about it? Over 2000 years ago God became man. Jesus Christ came from heaven and was born of a virgin in Bethlehem of Judea. He went about doing good, healing the sick, and preaching that all men should repent of their, believe on Him, and turn to the Heavenly Father. 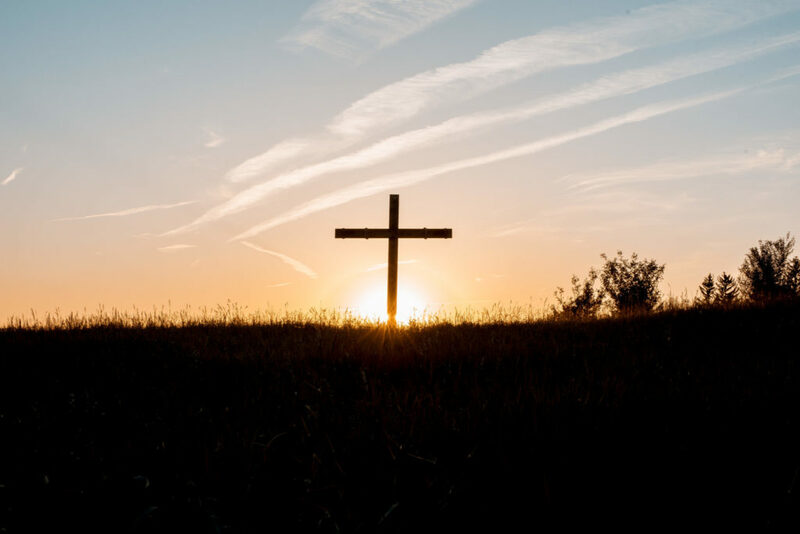 Then, at the close of his earthly ministry, He an indescribably painful and agonizing death on the cross so we could be forgiven of all our sins and escape eternal punishment in hell. The Word of God gives us many vivid details of Jesus’ death. Matthew 27:26-30 & 35, Then released he Barabbas unto them: and when he had scourged Jesus, (to be beaten with a whip made of leathern throngs, weighted with sharp pieces of bone or lead, which mutilated the flesh of both the breast and the back) he delivered him to be crucified. Then the soldiers of the governor took Jesus into the common hall, and gathered unto him the whole band of soldiers. And they stripped him, and put on him a scarlet robe. And when they had platted a crown of thorns, they put it upon his head, and a reed in his right hand: and they bowed the knee before him, and mocked him, saying, Hail, King of the Jews! And they spit upon him, and took the reed, and smote him on the head. …And they crucified him, and parted his garments, casting lots: that it might be fulfilled which was spoken by the prophet, They parted my garments among them, and upon my vesture did they cast lots. 1 Corinthians 15:20, But now is Christ risen from the dead, and become the firstfruits of them that slept. You may ask, “Why did Jesus have to suffer and die in such a terrible manner, and then be raised from the dead?” He did it because of his great love for you and me. This was the only way we could be delivered from the penalty of our sin and become the children of God. You see, we have all broken God’s law, and rightfully deserve to be punished for breaking that law. God has commanded us in his word not to lie, steal, hate another person, covet the things another possesses, commit fornication, commit adultery, or even lust after another person. Have you ever lied, stolen, used God’s name as a cuss word, hated another person, or lusted for another person in your heart? Violating any of these commandments means you have broken God’s law. Sin separates us from God. And, these sins can’t be hidden from God. Ecclesiastes 12:14, For God shall bring every work into judgment, with every secret thing, whether it be good, or whether it be evil. Isaiah 59:2, …But your iniquities have separated between you and your God, and your sins have hid his face from you, that he will not hear. Because God is just and holy, he must punish the sins we’ve committed. If an earthly judge were to excuse a murderer because he was sorry for his crimes, or because he was a good father, or because he did a lot of good things in the community, we would call him an unjust judge: and, rightfully so. Most people believe God is like an unjust judge, and will excuse them from their sins because they are religious, have been baptized, taken communion, are good citizens, are moral, etc. But remember, God is not unjust. All those good deeds do not right one wrong we have done, or erase one sin we have committed. If God is just, he must punish sin: and has said in his word, that he will judge sin. The penalty for our sin is to be eternally separated from God in a place called hell. 1 Corinthians 6:9-10, Know ye not that the unrighteous shall not inherit the kingdom of God? Be not deceived: neither fornicators, nor idolaters, nor adulterers, nor effeminate, nor abusers of themselves with mankind, nor thieves, nor covetous, nor drunkards, nor revilers, nor extortioners, shall inherit the kingdom of God. Matthew 25:41 & 46, Then shall he say also unto them on the left hand, Depart from me, ye cursed, into everlasting fire, prepared for the devil and his angels: …And these shall go away into everlasting punishment: but the righteous into life eternal. All would seem hopeless if it were not for Jesus. On our own, we could never bridge the gulf between us and God. Our sins have separated us from God. Even our best attempts to be good and right fall short of God’s standard. For, the standard for righteousness is not our neighbor, our culture, or even our own standard of morality, it’s God. Isaiah 64:6, But we are all as an unclean thing, and all our righteousnesses are as filthy rags; and we all do fade as a leaf; and our iniquities, like the wind, have taken us away. God has revealed his great love for us, and his desire to reconcile us to himself through the forgiveness that is in Christ Jesus. We needed someone to take our punishment, to pay our penalty. And, that is just what Jesus did. That’s why his death on the cross, and resurrection is so important. Jesus came to die in our place. He bore our sins in his body on the cross. He paid our debt in full. Isaiah 53:5-6, But he (Jesus) was wounded for our transgressions, he (Jesus) was bruised for our iniquities: the chastisement of our peace was upon him (Jesus); and with his stripes we are healed. All we like sheep have gone astray; we have turned every one to his own way; and the LORD hath laid on him (Jesus) the iniquity of us all. 2 Corinthians 5:21, For he (God) hath made him (Jesus) to be sin for us, who knew no sin; that we might be made the righteousness of God in him. Because you are a sinner, none of your good deeds can save you. Salvation is a gift of God. There is absolutely nothing you can do to earn it, merit it, achieve it, or add to it. Jesus’ sacrifice is the only thing that can save you from God’s wrath. Ephesians 2:8-10, For by grace are ye saved through faith; and that not of yourselves: it is the gift of God: Not of works, lest any man should boast. For we are his workmanship, created in Christ Jesus unto good works, which God hath before ordained that we should walk in them. Romans 4:3-5, For what saith the scripture? Abraham believed God, and it was counted unto him for righteousness. Now to him that worketh is the reward not reckoned of grace, but of debt. But to him that worketh not, but believeth on him that justifieth the ungodly, his faith is counted for righteousness. In Acts 16:30, the Philippian jailor asked Paul and Silas a very important question, “Sirs, what must I do to be saved?” That is a very important question, because if you don’t know what to do to be saved, you can never be saved or be sure you are saved. But, God wants you to be saved and to know you are saved. He says so in I John 5:13 - “These things have I written unto you that believe on the name of the Son of God; that ye may know that ye have eternal life, and that ye may believe on the name of the Son of God.” He came that we might have life. John 10:10-11 says, “The thief cometh not, but for to steal, and to kill, and to destroy: I am come that they might have life, and that they might have it more abundantly. I am the good shepherd: the good shepherd giveth his life for the sheep.” God offers you the gift of salvation, and an abundant life through the sacrifice of his Son, Jesus Christ. His salvation cannot be earned. It can only be received. The word “saved” means to be delivered, and to be made whole. It’s like going to the doctor and finding out you have a dreaded disease. Your only hope would be for the doctor to provide a remedy to deliver you from that disease; something that would make you whole. Jesus is the only remedy for your lost condition. Have you been seeking for peace, but can’t seem to find it? Would you like to be made whole? Do you want to be delivered from the penalty and the power of sin? Would you like to be forgiven, and know that you have eternal life? Are you willing to take God at his word? If you are, then God has the answer for your longing and searching heart. Repent - that is, turn to God from your sin. And believe - put your faith (complete trust) in Jesus Christ alone for your salvation: believing he died for your sins and that his resurrection secured your forgiveness. Remember, salvation is in a person, not a religion or a creed. Christ is not one of many ways to heaven. He is the only way to heaven. Proverbs 28:13, He that covereth his sins shall not prosper: but whoso confesseth and forsaketh them shall have mercy. Romans 10:9-10, That if thou shalt confess with thy mouth the Lord Jesus, and shalt believe in thine heart that God hath raised him from the dead, thou shalt be saved. If you are convinced of your complete inability to save yourself, and make it to heaven, apart from Christ death and resurrection, then “Seek ye the LORD while he may be found, call ye upon him while he is near:” - Isaiah 55:6. God has promised in his Word to save you, and give you everlasting life.